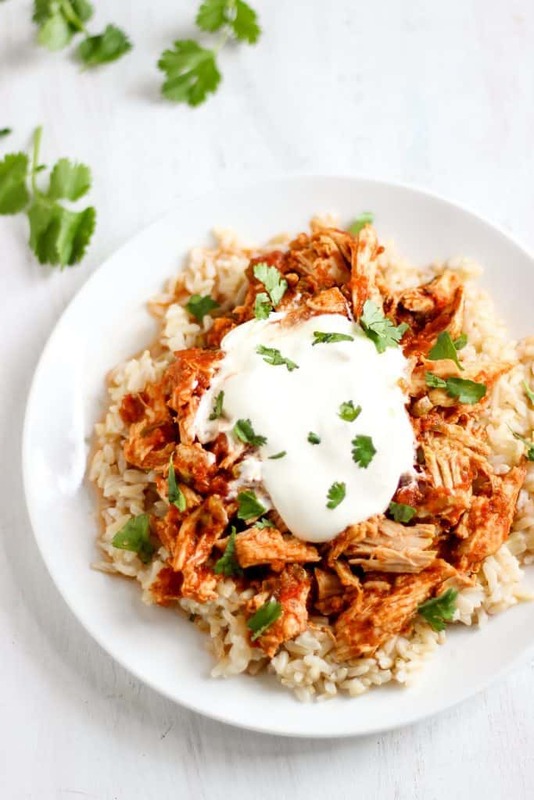 This 3-ingredient slow-cooker salsa chicken is super easy and delicious served over rice or burrito-style in a tortilla with all of your favorite Mexican toppings! Happy New Year! It’ll probably take me till March to stop writing 2016 as the date on my papers, but somehow, 2017’s already here. All of the talk about health and wellness around the beginning of the year gets old pretty quickly, but I think it’s never a bad time to evaluate where you are health-wise and to set new goals or focuses. I worked on re-committing to a couple of healthier habits for the second half of 2016, and I hope to continue those into 2017. The first is SLEEP. In high school, I remember sleeping 8+ hours just about every week night and more on the weekends. But college…has been a different story. Over the past two and a half years, I’ve definitely tested my body’s limits to see how much I can do on how little rest, and I’ve realized that while I can live on 5-6 hours of sleep per weeknight, I’m only functioning at 80% or so. The amount I sleep impacts everything else in my life, from my mood to my energy levels to my desire to exercise to my sugar cravings. It’s been important for me to constantly set new small sleep goals for myself because it’s easy to try to just push it a little more. I’ll stay up a little later to finish schoolwork/get sucked into the Instagram vortex while lying in bed, or I’ll wake up a little earlier to run longer, but it’s not worth it. I may have to write a post sometime about how my sleep mindset has shifted because it’s been such a positive change in my life! And my second goal is eating real meals. You know, with protein and stuff. When I eat a big, healthy dinner, my sweet tooth all but fades away at night. Again, eating real meals is easy to do when I’m at home with my family and a fully-stocked kitchen but when I’m busy at school, it’s way too easy to eat a giant handful of almonds, an apple, and a few bites of a leftover sweet potato and call it dinner. And then of course, I’m hungry an hour later and I just keep snacking, never really satisfied. That’s where meals like this super easy, three-ingredient slow-cooker salsa chicken come into play. If I can take 5 minutes to pull out my slow-cooker, toss in some chicken breasts, salsa, and taco seasoning, I can have a super healthy and delicious meal without much effort. These days, I write a loose “meal plan” of meal options for the week before I go grocery shopping. I don’t plan out specific days necessarily, but I just make sure I’m buying/cooking enough food for real meals until the next time I go to the store, allowing for a couple of times to go out to eat with friends. But back to this slow-cooker salsa chicken. I just used two chicken breasts this time for two servings, but in the future, I’ll cook three or four so I have more leftovers. Definitely use a salsa you love, since it’s a pretty prominent component of this recipe. I personally love Kirkland’s Organic Salsa from Costco. 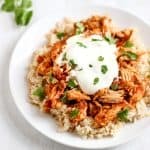 I served my salsa chicken over brown rice with lots of organic sour cream on top, which was delicious. But what I really wanted (and didn’t have the ingredients at the time) is serve it burrito-bowl style with black beans, corn, pico, and guacamole. This chicken would also be wonderful in a whole-grain tortilla or on top of a salad. 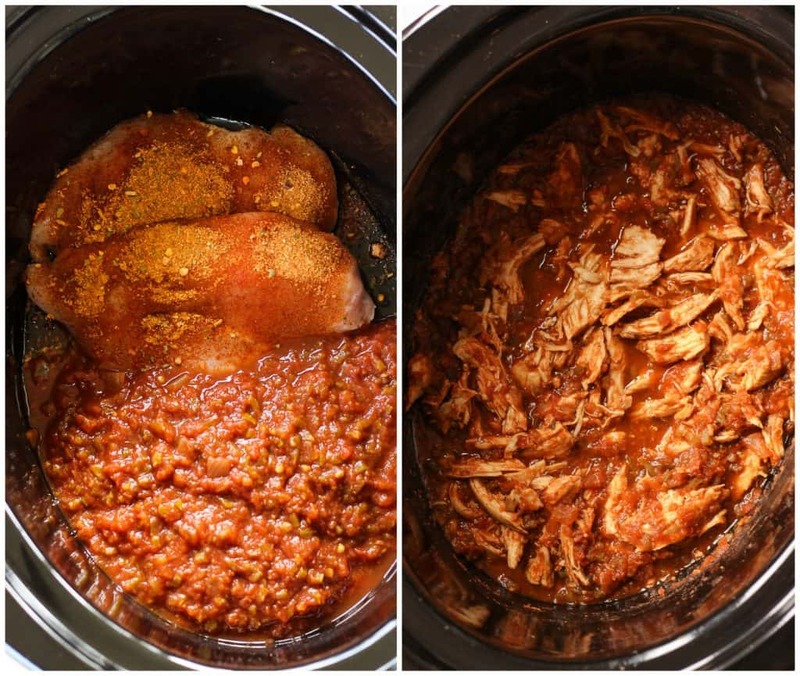 If you try out this slow-cooker salsa chicken recipe, feel free to let me know in a comment or take a picture and tag me @livbane on Instagram. Hope you enjoy! Your choice of brown rice, sour cream, avocado slices, guacamole, cheese, fresh cilantro, etc. Place all ingredients in slow-cooker and stir to combine. Cook on high for 3.5-4 hours or on low for 6-8 hours, depending on your brand of slow-cooker. I recommend making this for the first time when you'll be home to check it early, and then after that, make a note of how long your slow-cooker takes! When done, chicken will shred easily with two forks. 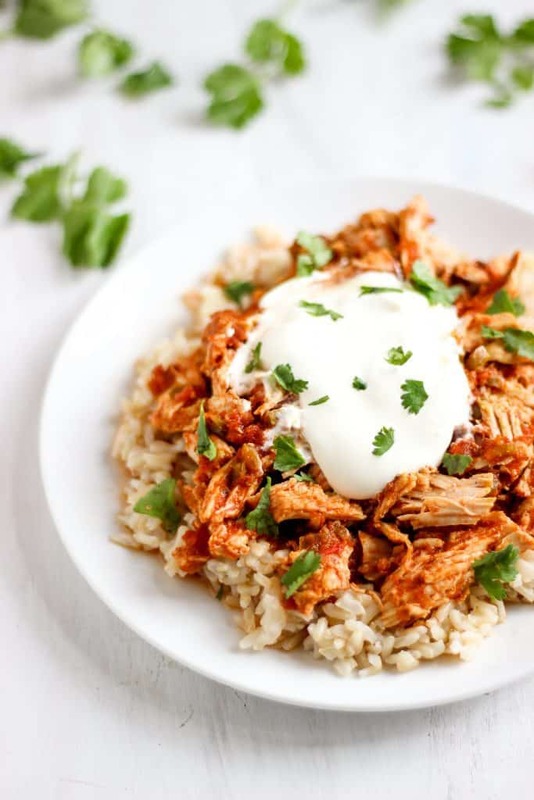 Shred chicken and serve over brown rice or inside flour tortillas. Top with favorite Mexican toppings like sour cream, avocado, guacamole, cheese, fresh cilantro, etc. Store leftovers in the refrigerator and enjoy within 2 days for the sake of freshness. Do you have any specific goals or focuses for the new year? I definitely will pull out my crockpot and try this. So easy. You’ll have to let me know what you think once you try it! 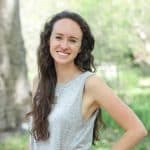 I have always struggled with prioritizing sleep and I would love to read about the steps you are taking to help with this problem. One of my goals for 2017 is to focus on getting rest and so far I am back to my same habits. Hey Lizzy! I’ll definitely plan to write about how I’ve been able to prioritize sleep this year then. Still not perfect at it but my sleep habits have improved drastically this year (without decreasing how much I’m able to get done)! Wow this looks absolutely delicious Liv! <3 I love the slow cooker for easy, quick super duper delicious meals. And I'm going to try to prioritize sleep more this year too. What a simple and delicious recipe! I’ve never actually used a slow cooker before so that’s one of my missions for winter this year, haha. Wow, really?! You’ll definitely have to give it a try this winter! This looks delicious! I love simple recipes that make tons of leftovers while we’re at school. One of my goals for this year is to be more intentional about making self-care a part of my day. I often tend to leave it for the end and then I’m too exhausted to even think about pulling out a book or my journal for a little quiet time before bed–so I’d love to get better at that! Sounds like an awesome goal, Claire! If my body lets me, I’ve been sleeping a little longer if I have time with later classes or on weekends. My mindset has changed a lot, too! I figure that it must help me recover better from workouts, be more focused on my work, and be less snacky. All good things! I think viewing sleep a “productive” activity itself rather than something I have to do *instead* of being productive is a game changer, if that makes sense! Love how easy this is! You’re right – take a couple of minutes to fill the crockpot and it really pays off! Love the idea of burrito bowls, too! Yes! I tend to forget about my crockpot sometimes but it’s such a useful tool! Yes! Meals that practically cook themselves are the best ever! We loved this chicken recipe!!! Now I’m having guests (crowd) coming over tonight–this is the main dish. I would like to prepare 8 chicken breasts instead of 2. Should I double the cooking time? So glad to hear you enjoyed this, Noremi! You may need to increase the cooking time just slightly, by 30 minutes or so, since your slow-cooler will be fuller, but you won’t need to double the cooking time. Hope your guests enjoy!